Improve reporting performance on large data sets by configuring a report to use Elasticsearch. 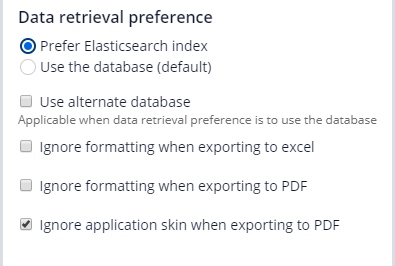 Configure a report to use Elasticsearch by setting the data retrieval preference on the Report Definition Data Access tab to prefer Elasticsearch, as shown in the following figure. For more information, see Report Definition Data Access tab.